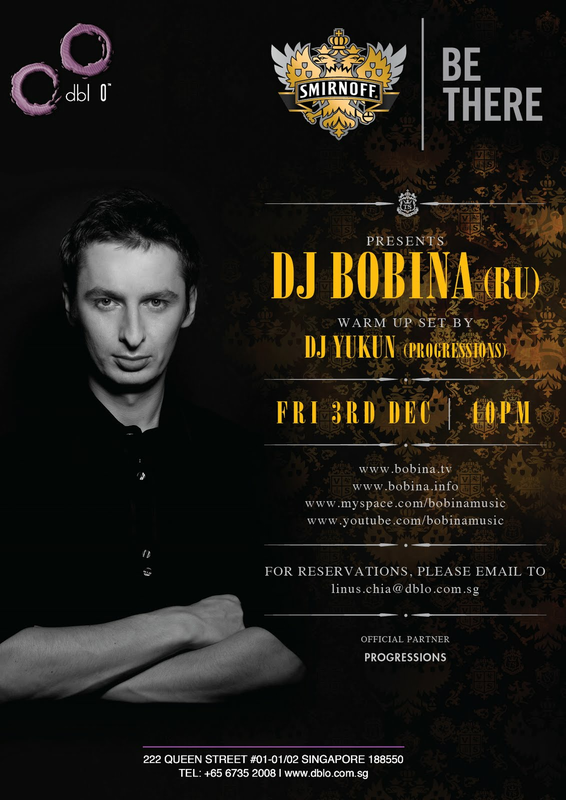 Join us for the much-anticipated debut appearance of Russia's biggest Trance /export DJ producer Bobina! For the third year in a row, the globe-trotting Bobina has entered DJ Magazine’s hallowed Top 100 DJs chart – coming in at this year’s no. 25. Having massive releases on the global record labels such as Ministry of Sound, Perfecto, Armada & Nebula, he's currently on fire is PPK vs Bobina’s ‘ResuRection 2010’ which has already been scoring big plays from Armin, Ferry, Oakey and many others! Supported by Singapore's prominent Trance brand PROGRESSIONS. All housepours spirits and Carlsberg draft beer @ $3.00++ per glass and $12.00++ per jug all night long. All table reservation to be sold at minimum 2 bottles of Smirnoff Black. Special promotion - 2 bottles for $300 with waiver of cover for 4 guests only.